Gîte next to old water mill on 2 hect. estate. Peace, natural beauty, very private! 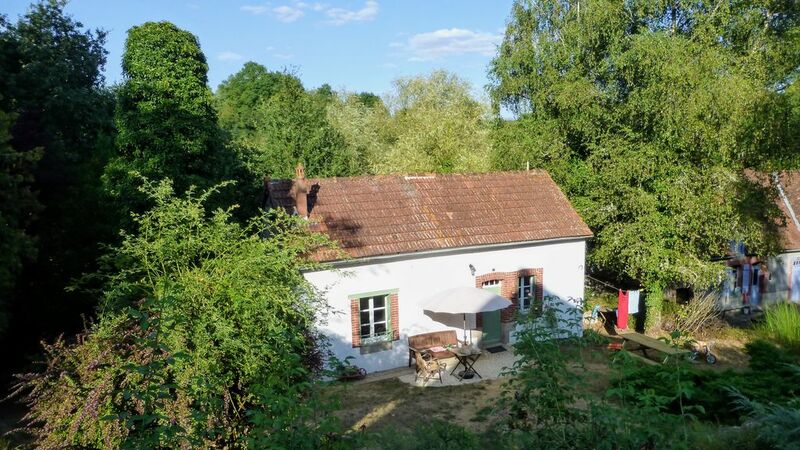 Recently renovated gîte, on a 2 hectare "park" with a big pond in fully nature. On this two-hectare park, which is a true arboretum, stands next to the old water mill with house from 1710 where much has been preserved, and is very nice to visit, this recently completely renovated nature house. It is a cozy four-person house, with a cozy living room downstairs with a wood-burning stove (no TV, a hi-fi music system with many CDs in all kinds of genres), a nice kitchen, a spacious walk-in shower and two bedrooms upstairs via an indoor and outdoor outside staircase. All rooms have wooden floors with 50 centimeter thick walls and the roof is extra well insulated. This makes it warm in the winter and pleasantly cool in the summer. The house is free on the property, very private! The entire estate may be used. Outside in the garden are a large picnic table, separate chairs, a second table and a large parasol. A Weber barbecue can also be used if desired. For children there is a lot to do: build huts, make dams in the rivers, rock or jump on the big trampoline! The house is situated in the middle of the rolling hills of the Limousin, in the department of the Creuse near the nice place Dun le Palestel. In the park around the house there are many trees, plants and flowers, a large pond (150 meters long) where you can walk around, exciting bamboo bushes, rivers, ponds and fruit trees. Regularly we see here foxes, deer, beautiful birds and all kinds of other beautiful things! The starry skies are enchantingly beautiful because there is no "light pollution" here and the air here is among the cleanest in Europe due to the absence of polluting industries. In all seasons it is beautiful here. Not only the summers but also the spring and autumn (Indian Summer) are a pleasure to experience. The temperatures are then often also very pleasant. In the cottage is a wood stove for pleasant evenings. The area is dotted with many walking and cycling routes. You can also go canoeing, boating, swimming in many lakes and rivers, visiting fish or museums (Vallée des peintres Monet, etcetera). At about 10 minutes drive is the Sédelle, a river that ends in the Creuse River. There is the beautiful arboretum de la Sédelle and you can make a great walk from and to Crozant with its beautiful views and ancient ruins. Cities such as La Souterraine (Route de Compostella), Chateauroux and Limoges are good to visit in one day. Many typical French villages are a few kilometers away. Throughout the summer, brocantes are organized throughout the weekends. The light is very special here at certain times of the day, which is why famous artists also like to come and paint in the Creuse. Only 3 kilometers away from Dun-le-Palestel this is even a hidden gem for born "Dunners". The gîte is right next to the old water mill from 1710 and this, together with the old miller's house, remained almost intact and of course to be seen. The domain is 2 hectares and next to the 150 meter long pond where you can walk with spectacular views is a great diversity of trees, plants, flowers and fruit trees. (at about 10 minutes drive you will find the arboretum de la Sedelle where you can also enjoy the natural beauty in peace!) The peace / quiet is unprecedented. Gorgeous starry skies, a wide variety of plants and wild animals. In Dun-le-Palestel you will find all kinds of facilities and shops, a large Intermarche and a weekly market. Pick-up at La Souterraine or San Sebastian station is possible for a small fee. You must have been here to experience the beauty and tranquility ... there is no photo, text or film against it!